A beautiful Cassini color-composite by Gordan Ugarkovic, this false-color image shows the ancient and heavily-cratered surface of Saturn’s moon Phoebe. Irregularly-shaped and bout 132 miles across, Phoebe is a fifteenth the size of our own moon but is believed to be much, much older. With its retrograde (backwards) orbit, high orbital incline and extremely dark, pitted surface, it’s believed that Phoebe was once a “Centaur” – a Kuiper Belt object that has been captured by Saturn’s gravity and adopted as a permanent member of the family. Kuiper Belt Objects (KBOs) are small rock-and-ice worlds that orbit the sun in the far reaches of the solar system. They are primordial remnants from the early days of the solar system, chunks of dark material that never coalesced into larger worlds or changed their chemical structure by solar heating. Centaurs are the term for Kuiper Belt Objects that have drifted into the inner solar system. 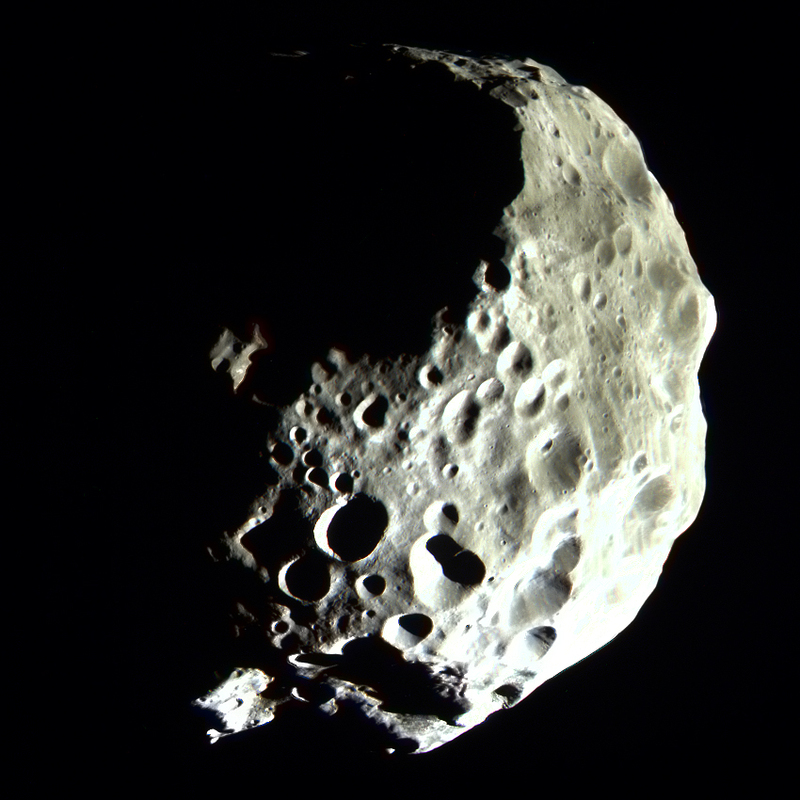 Phoebe orbits Saturn at a distance of over 8 million miles (nearly 13 million km).